Folks often ask me for smaller, more delicate pieces. When I saw this little collection of tiny fetishes there was a little aha! The trader had gotten them at auction so couldn't swear they are Zuni, but he thought they were. There is a fish (salmon of wisdom), a rabbit (who reminds us to face our fears), a wolf (teacher), buffalo (prayer, abundance), and a bird (magic raven? bluebird of happiness?). The trader thought they might be calcite. I took an old shell button and set a tiny natural turquoise cab in sterling for the centerpiece. 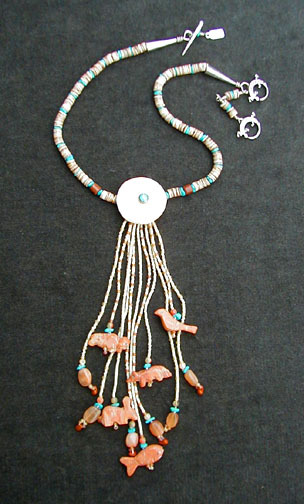 The slinky heishe necklace is interspersed with turquoise bits and some jasper. Lizard (dreaming) toggle closures make it wearable at two lengths. It is signed and dated.